JDi is proud to continue supporting the Alzheimer’s Association and all of the important work it does. The Alzheimer’s Association’s mission is threefold: to eliminate Alzheimer’s disease through research, to improve care and support for all affected, and to promote brain health to reduce the risk of dementia. JDi is a longtime supporter of the Alzheimer’s Association due to personal experience with the impact of this disease—and the knowledge that we are not alone in facing the effects of Alzheimer’s. As our population ages, the impact of Alzheimer’s is projected to become even more widespread. There are currently 5.8 million individuals living with Alzheimer’s in the United States, but that number is estimated to grow to nearly 14 million in the next 30 years–unless, of course, our researchers find ways to prevent, cure or slow Alzheimer’s disease in that time. 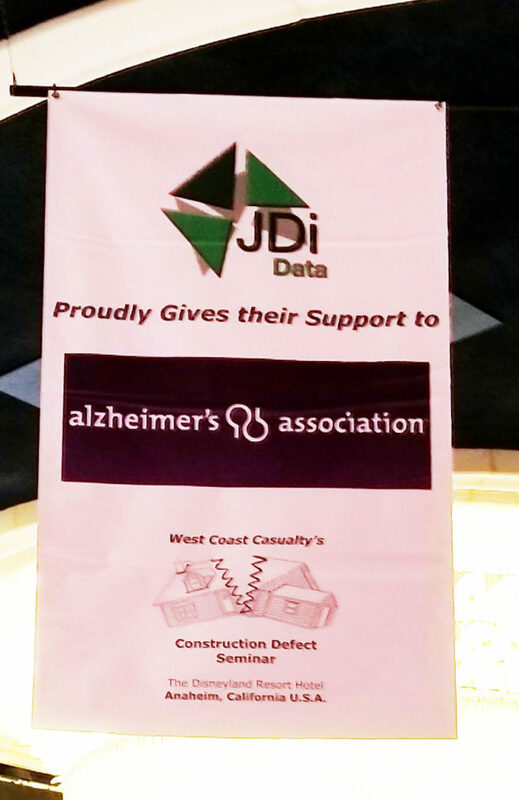 JDi’s banner at last year’s West Coast Casualty Construction Defection Seminar in California. Our support is only one tiny piece of the puzzle, but we’re proud to be able to support the Alzheimer’s Association year after year. Learn more about how you can help the fight against Alzheimer’s here: https://www.alz.org/get_involved.